Since 1996, residential land prices have raced from 110 per cent of GDP to nearly 220 per cent of GDP. Meanwhile, wages have declined modestly against GDP. “First Home Buyers’ incomes have simply not kept up with the strong rise in land prices. Here is the proof,” Prosper Australia Buyers Strike campaigner David Collyer said today. “This fifteen year period breaks away from a very long trend where wages and land prices were strongly correlated. “In the last year alone, wages are down 1.4 per cent against GDP, while land is up 20.8 per cent. Collyer was commenting on the release of the Land Values Affordability Comparator which examines both wages and land prices, over time, against the strength of the overall economy. The Comparator shows just how profoundly unaffordable land is for FHBs. “It is no wonder buyers are angry and frustrated. Young adults are urged by their families and society to get started, to buy a home, to begin accumulating assets. But the numbers cannot be made to add up. “FHBs have taken the only rational action possible: renounce home ownership for the foreseeable future while saving a larger deposit and investing elsewhere. “The property market needs a continual flow of new entrants to maintain forward momentum. It is no longer receiving them. Our Buyers Strike merely formalises what the market is imposing on FHBs. The Buyers Strike advocated by Prosper Australia has captured the imagination of FHBs visiting the GetUp site and following property issues elsewhere on the internet. “The campaign has had no mainstream media coverage and must be actively searched out, which makes the groundswell even more remarkable,” Collyer said. It must be noted that Prosper is not today calling the bursting of The Great Australian Land Bubble, but does assert it is ‘imminent’. * An xl spreadsheet of the graph data is available on request. P.S. : That graph actually understates the problem, because what I have called “wages & salaries” includes employers’ contributions to insurance and super. Had I excluded those contributions, the red curve would be lower and declining faster. Meanwhile the latest attempt to deny the housing bubble (http://is.gd/PWpCE5) has been answered at http://blog.lvrg.org.au/2011/03/bubble-deniers-plead-no-contest.html . It would be interesting to add in line for the uptake of the internet and the power of personal computing, adding the ability to move numbers and money around faster. Ryan – if you owned all the money in the world & I all the land – how much would i charge you for your first night’s rent? This is why Winston Churchill said ‘land is the mother of all monopolies’. In economics speak land does technically mean everything above the land surface and everything below it. With data usage rates spiking 45% since the iphone & ipad revolution, the value of the Electromagnetic spectrum has also skyrocketed. If we included other scarce resources like the EMS to this Comparator, the difference would be even more pronounced between what wage earners get and what owners of privileged property receive as society naturally develops. Why work? Speculate is what the tax system beckons for us to do. Such a tragedy there are so many negative side effects a la Ireland, Spain, USA, UK, Greece, Latvia, Iceland. I would be interested in seeing the spreadsheet containing the data for this graph. In particular, I would like to see the date range extended back another 10 to 20 years. Are you able to provide a link to the spreadsheet? Matt Hawke: The figures are straight from the ABS. 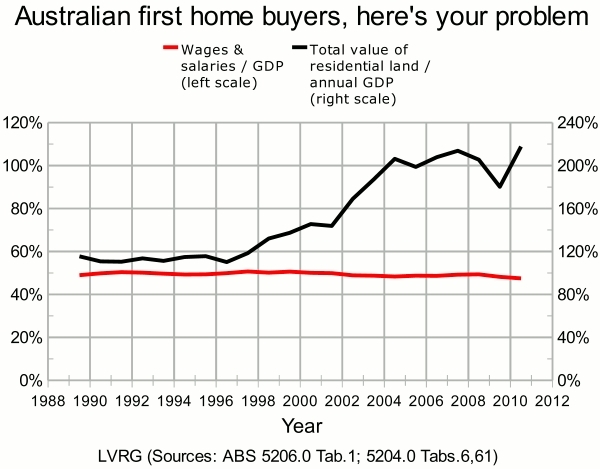 More details at http://blog.lvrg.org.au/2011/03/how-land-prices-outgrew-workers-incomes.html . purchased from the coach hire desk.